Find My Workspace lists over 95% of the business centres market in Ipswich. Simply click Request Quote to check pricing for one office, or Add to Basket for multiple offices. 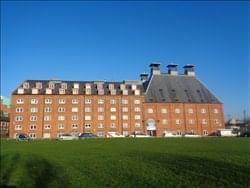 Offering fully serviced offices to let in Ipswich along with conference facilities on flexible terms. 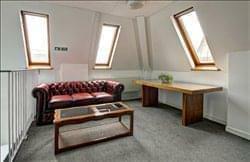 This business centre in Ipswich houses fully furnished offices from one to 10 people with quality furnishings. It offers a simple, economic all-inclusive, monthly charge for offices, and a simple short term licence agreement. The offices to rent in Ipswich could not be more convenient. No gas, water or heating charges. Maintenance, repairs and dilapidation are included. There is a prestigious meeting and conference room facilities with latest presentation technology and a spacious prestige reception. With on-site allocated parking available on request, comprehensive secretarial and administrative facilities and refreshment and break-out areas, this is a great space to work. Based in the centre of Ipswich, this five-storey building has been given a new lease of life with a significant refurbishment having been completed recently. The centre’s striking new grand entrance, combined with its large reception area flood the building with natural light and will also be sure to impress visiting clients. The centre’s helpful and professional onsite management team will be on hand to welcome guests and give you any assistance you need, allowing you to focus solely on business. The centre also boasts a range of breakout spaces and social areas for tenants to meet, relax, discuss work or network. One of these spaces is the inhouse coffee shop. The centre also has shower facilities and bike storage. Refurbished throughout in 2002, this centre provides four floors of fully serviced workspace in the South Malting’s side of the building along with conference and training rooms. In addition the centre also boasts a breakout area and cafe with free parking provided for tenants and guests. This centre offers a range of quality and affordable office space with sizes starting from 19.3m². All units are let on an all inclusive basis allowing you to easily budget. Rentals include; service charges, 0.5MB Broadband (upgraded internet speeds are available), 8 Hours free conference room use for across East Anglia, while all units provided with electricity, gas and water, manned reception Monday-Friday 8:30-5.00PM.